With the Oocher in an Albany repair shop to have her outboard motor’s carburetor overhauled, we headed north for Waterford on September 28th, again without her services. No matter. We were in tidal water, so that when we got underway from the floating dock at Rensselaer, we could just let the flood tide swing the schooner’s stern off the dock; we didn’t even have to use the tug, much less the Oocher, to get ready to back out into the Hudson River. Heading upstream, we shared the Troy Lock with the big tug Margot, a local vessel that we knew from several Tugboat Roundups at Waterford. After two days as a floating museum in Waterford, we took delivery of an old friend, the Red Oocher, with her 25-h.p. Johnson outboard. The Red Oocher had been our assist tug and tender back in 2004, the first year of operating the Lois McClure, and here she was back alongside after being launched from the trailer that brought her down from the Museum. As you might be able to guess, she is a red inflatable boat. When Tom Larsen used the red original to pull the bow round, getting underway for Schuylerville on October 2nd, he kept calling for “More power” on the radio to Ian Montgomery, and though Ian did respond with the throttle, we seemed to be in slow motion. We were just spoiled by the double horsepower of the Oocher; the Red Oocher got the job done, just as she always had. And she assisted so well when Tom landed the schooner just above Lock 5 at Schuylerville, that he only needed one slow backing bell to the Churchill to bring her alongside. Schuylerville is on the south side of the “summit” in the Champlain Canal, the point where you stop going up, heading north, and start down. So this was the best place for Art Cohn to climb into his wet suit, shoulder an air tank, and submerge to inspect the bottoms of the schooner and tug. 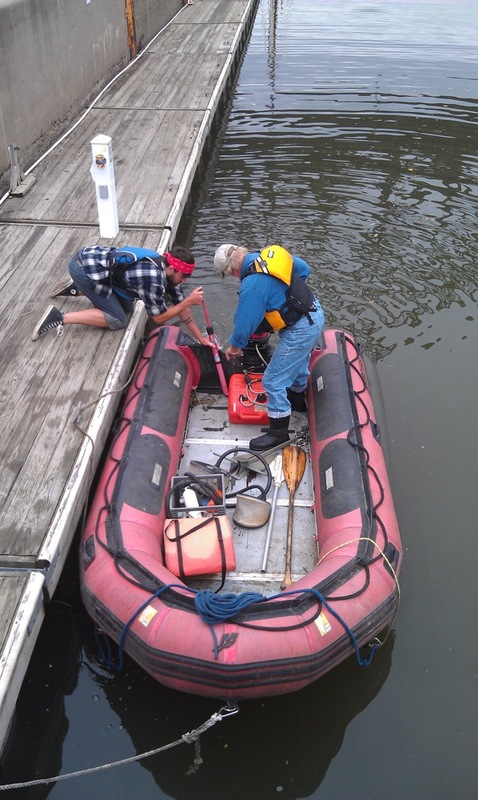 The point of the inspection is to ensure that the vessels are not giving a free ride to any invasive species, ornery critters like spiny water fleas, not already over the summit and so into Lake Champlain, critters that can change the environment, not necessarily for the better. 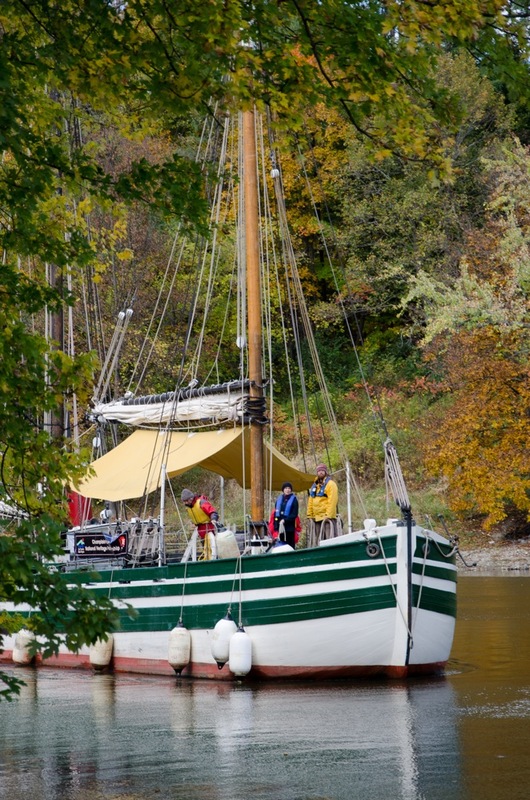 An asset to Schuylerville is Bob Foster’s stern-wheel tour boat, the Caldwell Belle. I believe I have marveled previously in these pages about how she is a true stern-wheeler, using the big paddlewheel as her sole means of propulsion, rather than as mere decoration as on some “stern-wheelers” you see, and about how skillfully Bob maneuvers her. 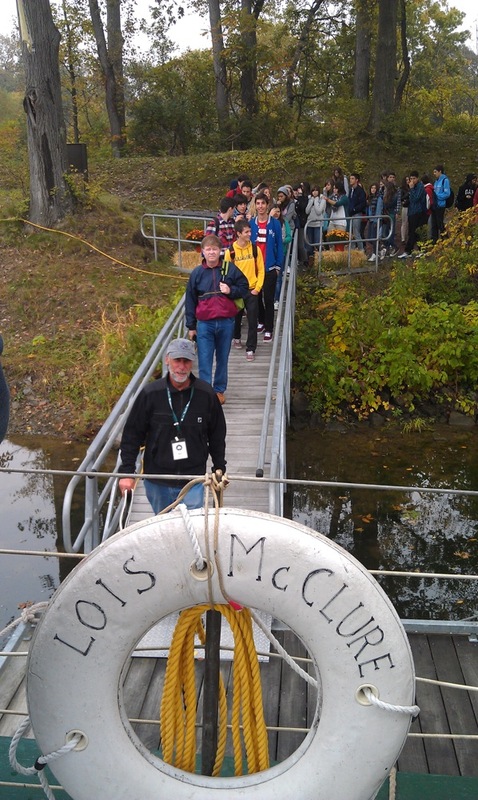 Well, on the day the Lois McClure was open in Schuylerville, Bob had fifty students on an exchange program from Spain take a trip up and down the Champlain Canal in the Belle, and, when they returned, we got to show them through a replica of the kind of canal boat they would have passed 150 years ago. We had become somewhat inured to stumbling along in French while navigating in Quebec, but most of the crew were not even beginners in Spanish, so pantomime took over. Another Schuylerville asset is the wonderful park the town has created at Hudson’s Crossing, where we were moored. But Schuylerville’s chief asset is the hospitality of her citizens. At the park’s pavilion, they treated us to another delicious pot-luck dinner. 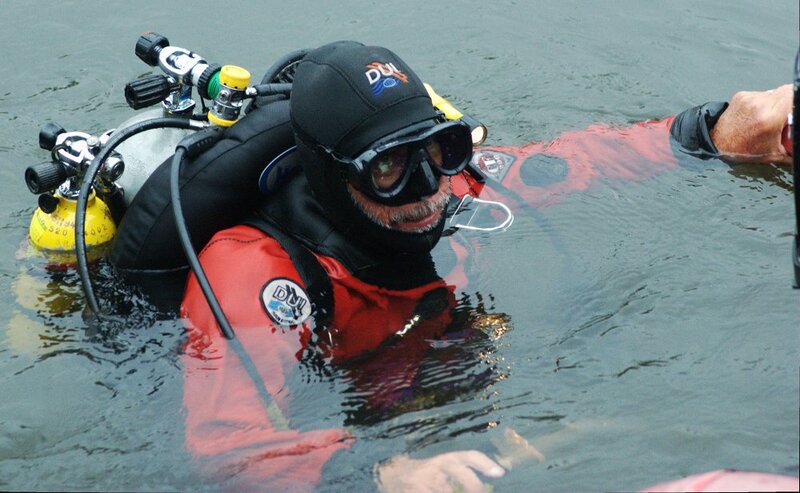 The Oocher returned to us in Schuylerville, as good as new, on October 4th. We thanked the Red Oocher and made her fast alongside the schooner, just ahead of the tug on the hip, where she could be towed back to the Museum, out of the way. That afternoon, we made our way up the canal to Fort Edward through the rain. We have had an amazing summer of one fair, sunny day after another. So the rain seemed unfamiliar, though certainly welcome, for we have traveled through lands of severe drought. Throughout this trip, the water levels in the different waterways have been uncommonly low. We also made our way past and among the many dredges, tugs, and barges associated with the huge dredging operation that is proceeding on the Hudson River to rid it of PCBs (polychlorinated biphenyls). There was considerable trial dredging, then months of monitoring the results in the water column, and now, after seeing improvement, the continuation of carefully removing mud from the bottom of the river. The fouling and unfouling of our waterways has been an expensive lesson. When our museum duties were over in Fort Edward, Neil Orsini invited the crew to be his guests at his restaurant, the Anvil. Elegant. That night, as at many of our ports-of-call along the Erie, our sleep was interrupted, or perhaps our dreams augmented, by train horns, as one locomotive after another, hauling freight cars, announced its arrival at a crossing. The railroad, like the canal before it, sought the route east-and-west with the least change of elevation. The train whistles were a not altogether unpleasant reminder to us canal-boaters of the competition that did us in. 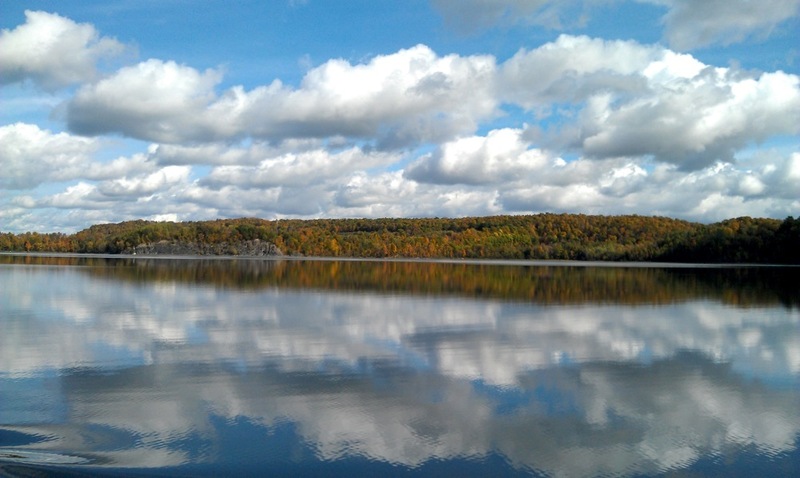 On October 6th, we traveled down to the north end of the Champlain Canal at Whitehall. 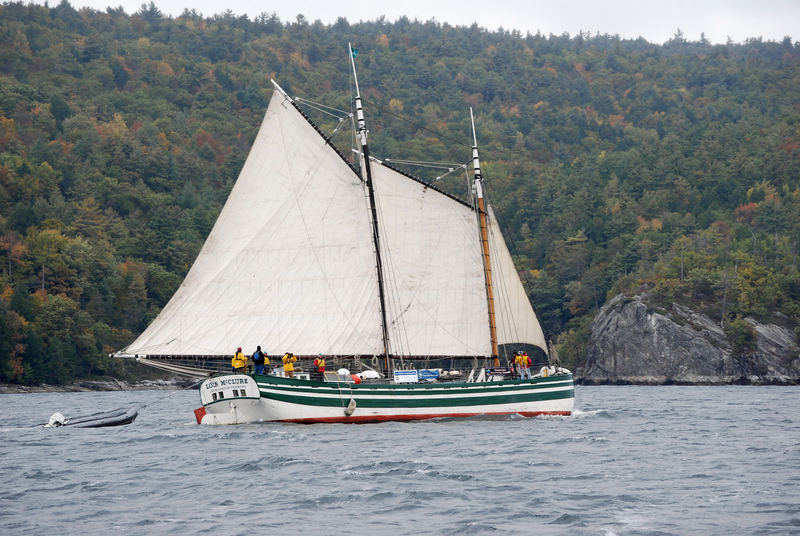 But not before extricating the schooner from the narrow confines of Fort Edward harbor. The Hudson River flows gently past Fort Edward, its current split by Roger’s Island. The mooring wall is on the left bank, where the water, moving round the east side of the island, scours out the riverbed to a depth of about 8 feet. But that 8-foot channel is only about 50 feet wide, and the river level was down a couple of feet. We have to swing the schooner’s bow around to point downstream, and you’ll recall the vessel is 38 feet longer than 50 feet. So, the bow swings through shallow water. To make the McClure generally more maneuverable, we lower the centerboard 2 feet, so the forward part of the vessel draws nearly 4 feet, loaded lightly as she is with 11 tons of ballast stone. You guessed it: the centerboard touched bottom as we swung. But we had a few feet to back in even closer to the wall, and that drew the board clear. Getting underway from Fort Edward is always interesting. The most noteworthy event of our passage to Whitehall was the announcement that Ian Montgomery’s biscuits, sausage gravy, and scrambled eggs were ready as a second breakfast. And to cap off another good day on the Lois McClure, Tom Larsen made a brilliant landing, turning the schooner 180 degrees to come in starboard-side-to, pinning the bow against the wall with the Oocher and a bow line, and working the stern in by going ahead slow on the tug with her rudder hard over. What a crew! At Whitehall, I had the great pleasure of welcoming on board to join the crew my son Dean. He, of course, has been exposed to boats along the way; like his Dad, he lives on board a small vessel, his Millie Hill being berthed in Seattle’s Lake Union. He was able to see how well we live in the Lois McClure on his very first night: the citizens of Whitehall had the crew over to the Old Bridge Theater for a pot-luck dinner. Of course we diners were lucky with every pot; these affairs might better be called all-star-recipe dinners. 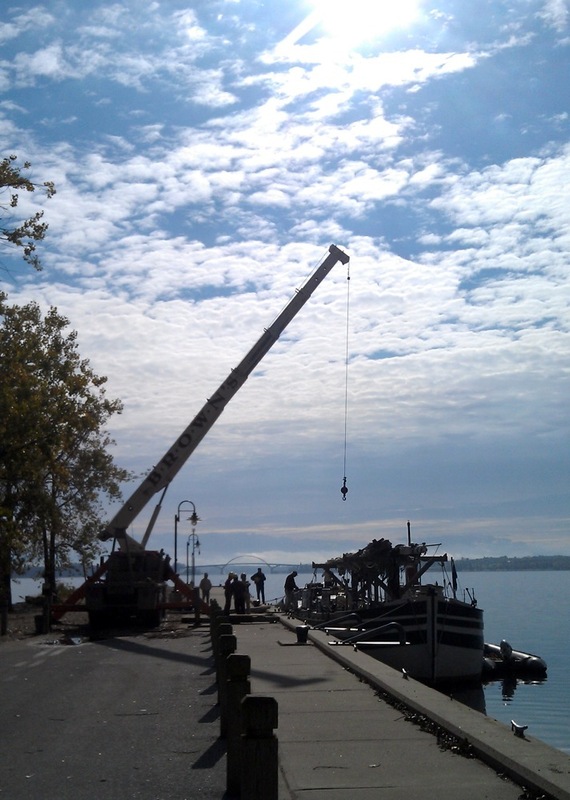 The Lois McClure returned to Lake Champlain on October 8th. Bound for Port Henry, we went down through Lock 12 at Whitehall and started south on the narrowest part of the lake. As promised, Art Cohn blew a long memorial blast on the C. L. Churchill’s horn as we negotiated The Elbow and passed the house where Cora Archambault used to live. On this crisp, fall day, we reveled in the scenery. The twists and turns of our watery road; the marsh grasses, still with their summer green; further off, the steep, high banks, mostly forested, but with the occasional rocky outcropping interrupting the red and yellow foliage: none of it escaped our admiring gaze as the schooner and her tug slid quietly along. It was crisp enough so that we were glad to have a wood fire going in the “Marine Household” in the cabin. And we were grateful to volunteer Bob Abell, who met us in Port Henry with a welcome gift of 160 pounds of pea-coal, so that we wouldn’t run out of firewood. We were also grateful to Erick and Sarah Tichonuk, who invited the whole gang from the Lois McClure up the hill in Port Henry to their house for dinner. 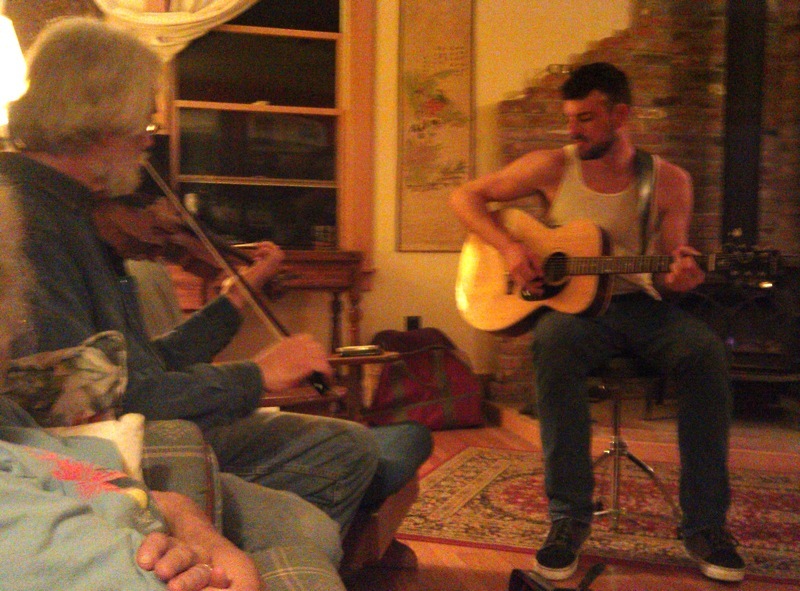 It was one of Erick’s multi-main-dish extravaganzas, and it was topped off by some mighty fast fiddling and guitar work by Doug Riley and Ian Montgomery respectively. We had moored on the south side of Port Henry’s big pier as a good place to bring a crane to lift the schooner’s masts up into place. Team Kerry [Batdorf] did its usual smooth job of rigging the canal boat so she could go sailing. And go sailing we did! We were bound north on the Lake to Essex on October 10th and woke to a light breeze from the south that promised to grow during the day. Perfect. Casting off from the dock with the Churchill on the hip, we towed into the wind while hoisting mainsail and foresail. Erick had reluctantly left his office desk job, with its phone messages and meetings, to take over the fresh-air duties of First Mate for the day, so it was he who gave orders to the hearties hauling on the halyards: “Haul away throat; hold the peak; now, haul peak and throat together; ‘vast hauling; go to the jig tackles,” etc., etc. When both sails were set to satisfaction, with the gaffs at just the proper angle, we cast off the tug to accompany the schooner and backed the foresail to turn the vessel off the wind. In the light air, she went round so slowly that we had time to drag the jib up out of the fo’c’s’le and set it to help her before we were settled on our course for Barber’s Point. Then we had a fine broad reach in a breeze that that slowly came up from light to moderate. By the time we passed Barber’s Point and headed for Split Rock, we were making 6 knots. By my count, we had six souls on board who were experiencing the schooner under sail for the first time. Volunteers Doug Riley and Jeff Gorse, who had put in towing time during the summer, had returned to the vessel on Lake Champlain hoping to see her under sail; Jean Belisle, our able seaman and academic historian from Montreal, no stranger to the schooner’s decks, had not yet been under sail in her; Dean Taylor, on board for three days, really lucked out; Ian Montgomery, a new crew member this year, had yet to see her canvas aloft; and, for Barbara Bartley, a veteran interpreter on board the Lois McClure, it was not only her first sail in the schooner, but also her first sail in any boat! She really enjoyed it. We were all disappointed that Caroline Kennedy, another new crew member this year, had to miss her first canal schooner sail due to illness. Well, we hope to see her on board again next year. At Split Rock, it was decision time. Changing course to the left, for Essex, would mean getting the schooner from starboard tack to port tack. Erick and I were both a bit dubious about jibing that big mainsail in a breeze that was giving us some fresh gusts. When that long main boom swings over in a jibe, as the wind suddenly changes sides on the sail, the heavy spar accelerates rapidly with plenty of force. Would it be better to go to all the trouble of bringing her up close-hauled, tacking under good control, and then paying off on the other tack? I wondered about running in under the lee of Gardner’s Island, taking in sail, and then simply towing across to Essex? Dean built on that idea, saying if we went into the lee, why not jibe there? That made sense, so that’s what we did. And then had the best sail yet in the Lois McClure. As we came out of the lee of the island on a course for Essex, we found ourselves on a fine reach with the wind just forward of abeam. Didn’t she like that! She heeled over and just surged along, going like a train of cars. Who said we can’t compete with the railroads? That wonderful leg across the Lake came to an end all too soon, and we rounded up just off the New York shore, took in sail, and Art Cohn brought the Churchill onto the hip to tow the schooner in to the dock at the Essex Shipyard. At Essex, we had our last school group of the cruise on board. While it is certainly satisfying to share the Lois McClure and her cargo of history with grown-ups, it is even more special to have youngsters troop on board and witness their amazement, as they imagine themselves as part of a canal-boat family in 1862. Say, the McClure’s supper cooks and wash-up crews seem to have had it mighty easy toward the end of this trip. 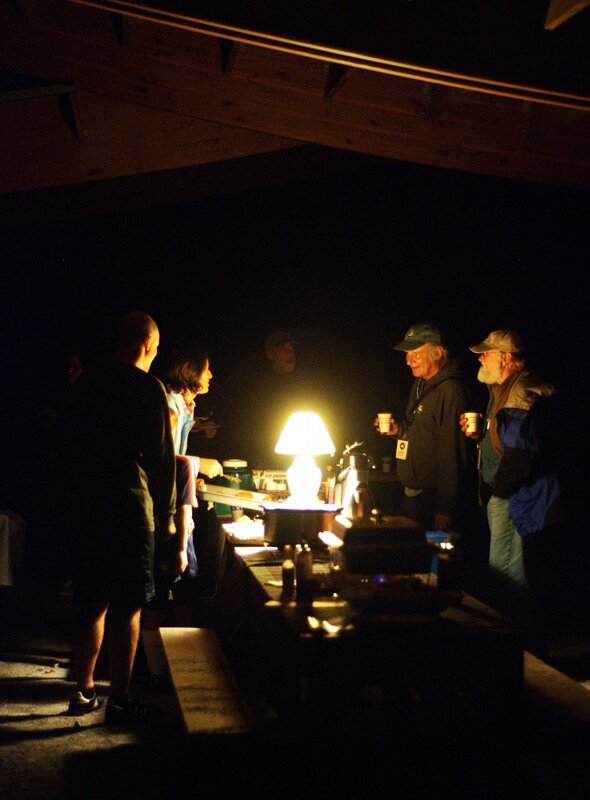 On October 11th, we had yet another great evening meal ashore, this one at the gorgeous home, on the Willsboro peninsula, just north of Essex, of Chairwoman of the Museum Board Darcy Hale and her husband Bruce. The many culinary delicacies were punctuated by one of Darcy’s famous German chocolate cakes. 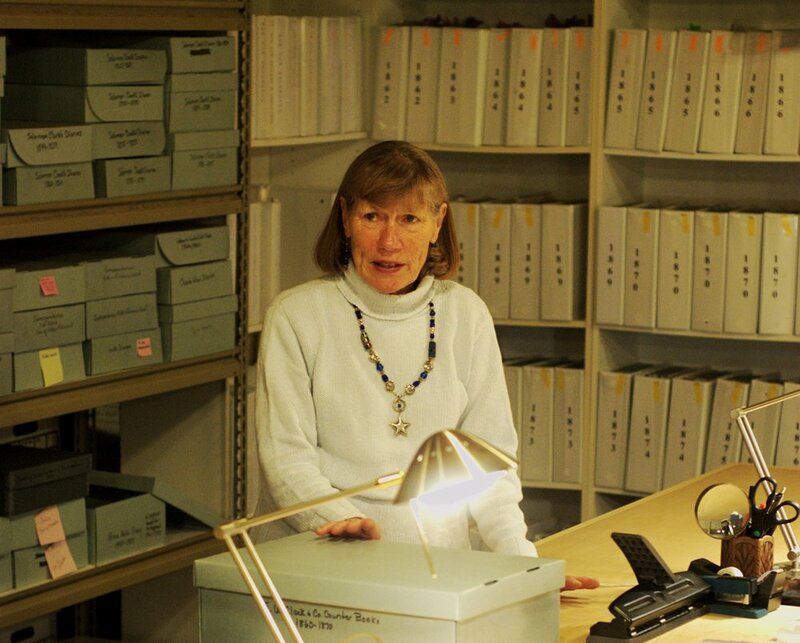 And, down in the basement, we had a tour of the collection of the recently formed Hale Research Institute, which cares for a multitude of records, photographs, and artifacts of the quarrying, shipbuilding, and farming businesses that used to be conducted on this point of land in Lake Champlain. As we got underway for Vergennes on October 12th and began towing back up the Lake toward Otter Creek, a northwester began breezing up. 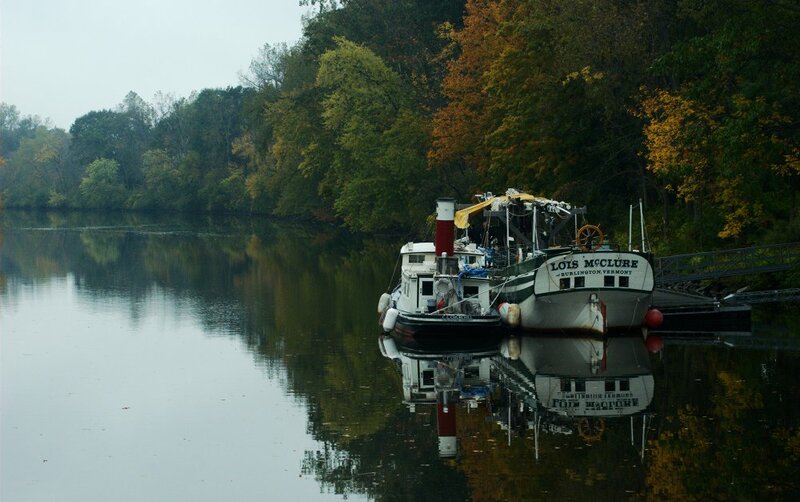 We were due to moor in the Creek just below the falls in Vergennes by mid-day so as to be ready by 3 p.m. for a Welcome Home to the Lois McClure. With that schedule, we had to forego sailing to the mouth of the Creek, though we always hate to waste a fair wind. Towing the Lois McClure up Otter Creek is a delight. It seems so amazing to be able to take the big schooner into such a narrow waterway through mostly wild woods, even though she was built for narrower canal locks. It astounds me that the steamboat Reindeer, more than twice as long as the McClure, used to negotiate these tight turns.